No chimichanga but Chinese to go! So… today… I was hungrier than usual, especially tonight… oh my! I wanted to eat… eat… and eat some more! So I made myself a roasted portobello mushroom and then added some “queso panela” (a fresh kind of Mexican cheese) and ate it… but it wasn’t enough… not for the hunger I was feeling! I went to the refrigerator and NOTHING! It’s pretty much empty! We need to go grocery shopping! and then I found it… I had a frozen chimichanga that my dad bought when he came to visit last weekend… I didn’t even think about it and got it in the microwave… I was hungry! And nothing would stop me! “It’s just today! right? tomorrow when we go grocery shopping I’ll eat right again… Plus… it’s weekend…” so.. you can see how I was thinking! My chimichanga was ready… I could smell it… it wasn’t homemade… it was nothing fancy or special but it was saying MY NAME! oooh! I couldn’t wait to eat it! … hubby even said: “are you supposed to eat that?” and I said “no but I will! I am hungry!” and he said no more… something inside of me… I guess it was my conscious still made me look at the amount of calories… and guess what I read: 790 calories per serving! My legs weakened and I just threw it in the garbage! 😦 … Good bye chimichanga! You were tempting but I am strong! Plus I know I am not really HUNGRY… right? I have to control myself! I ate what a normal thin/healthy person would eat! I got you pegged you fat mind!!! it is you all along telling me those lies of me “deserving to eat a chimichanga” like if it was some kind of reward! But you know what? I deserve NOT TO EAT IT! I deserve better than 790 calories! I deserve a healthy me! I am not that easy!!! so there you go bad thoughts… to the garbage along with that big fatty taco! -sigh- seeing that 790 in the wrapper was the “mental slap” I was needing to “come back to my senses” … I am glad something in me made me check before eating! I know I would’ve felt horrible had I eaten that thing! Well… we all have highs and lows… especially in the “weight loss journey” am I right? after I reached “overweight” and left “obesity behind” I’ve been -1.0 +.7 +.9 (HUH!!??) -.4 and so… it’s been weird… you know? pretty much leaving me in the same place but when you see a +.9 u can’t help but say “what in the world?? ?” … Anyway… I am focusing on “how I am feeling” and How I am looking… I can’t believe I can see my belly button without having to “look for it” LOL! so… anyway… It’s been good overall… and I am here… fighting! exercising and eating right! Just on the other night hubby and I went to watch “The Hunger Games” movie! I watched it when it Premiered but hubby hadn’t seen it… we went to one of those “Restaurant/Theater” type of thing so the waiters are serving food right in front of you if you order anything… while you are WATCHING the movie… well… it was a “Hunger Game” for me… and even when I was tempted by hubby who had amazing things to eat (including a “brownie pie” – warm brownie, with a scoop of ice cream, whipped cream and chocolate syrup- and a cup of coffee on the side) and he insisted I should eat because we “never do this” I stayed strong and said “no thank you! you go ahead… don’t worry about me” (and as you can see… he truly didn’t! LOL!) 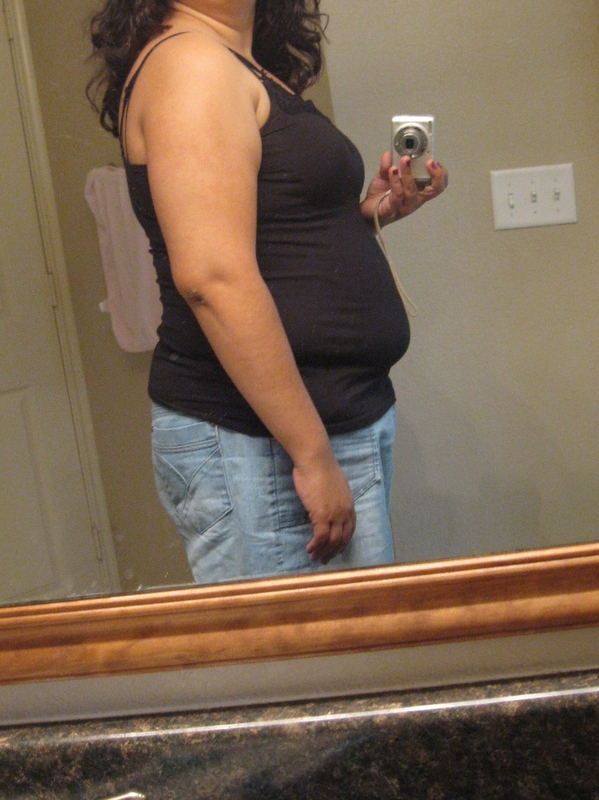 so… I know I am doing what I am supposed and I will continue to reap the sweet fruit of a healthy/lean me! anyway… just wanted to update because it’s been a few days since I last wrote anything here… Thank you for reading! Thank you for being here! If you are on this same fight too… don’t give up! If you fall… get up! You can do it!!! Many Hugs and Many blessings! I hate the way I look, why would I want to share that? So… the other night my 3 yr. old came to our bed because she was afraid, as soon as she fell asleep I tried carrying her back to her bed… It was hard to move her, she is so big and heavy now… I mean… she has a healthy weight for her age, but… when did she grow up so much!? It seems it was just yesterday when she was my little baby… so as I carried her to her bed I thought “I won’t be able to carry you like this for much longer” and then… it hit me… I was carrying her 24/7 ! She weighs exactly the amount of pounds I’ve lost (a little more than 35 pounds!) it’s amazing! It is “shocking” when you “see it –or feel it– like that” No wonder I was always tired! And the amazing thing is that I still have about 1 and a 1/2 3 yr. old to lose in weight! LOL! I was even thinking that maybe I won’t even know how to “move anymore” LOL! The difference in weight will be so different that maybe I’ll just be flapping my arms around uncontrollably! The idea (at 2 in the morning) made me laugh… as I thought of myself jumping around with big jumps and weird movements instead of walking normally because of my “light limbs” LOL! Me: My hands are older! Me: What? what do you mean “I know”? Hubby: Oh yes, I noticed in church! Me: -gasp- oh my… in church? This Sunday? Hubby: Oh! And your feet too! Me: (terrified) My feet? they are older? I’ve always thought that when I lose weight my husband is finally going to see me for the first time! He met me fat and fat I’ve been, he’s seen me a little thinner and bigger than this but he’s never really seen me thin… and I’ve always looked forward to the day when he can actually SEE ME instead of all this extra stuff that is COVERING ME… but now… I realize that I don’t know how I’ll look either… I am actually nervous and excited at the same time about seeing myself too… almost like “meeting someone new” because I’ve changed… It’s been years since I last saw me thin and I don’t know how *I* really look anymore… I’ve never met the 33 year old thin version (REAL VERSION) of me… and I can’t wait… that’s ok if my hands are older… they already were… I just hadn’t noticed because they were sooo stretched with all the fat that there was no way a wrinkle would show… they are not really THAT wrinkly… just different, just older… they are MOM hands… I guess I should start buying some lotion though… LOL!